Candy Dots- This classic candy costume was made by taking 1/2 styrofoam circles, spray paint 6 of each color and then hot glue to a white t-shirt! Pineapple- One of my very favorites! Make an upside down “V” shape out of tape or black marker. Add them to a yellow t-shirt. The topper is again, green fun foam hot glued to a headband. 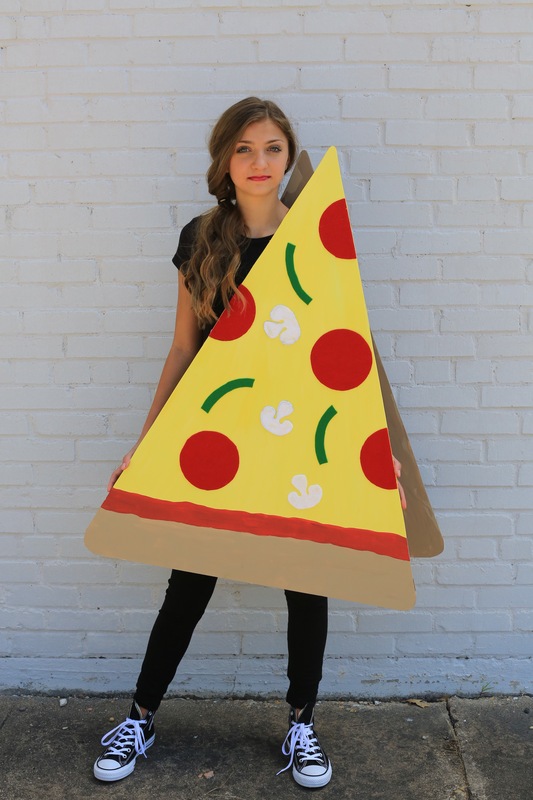 Pizza- Cut a triangle shape out of cardboard or foam board. Paint brown crust, red sauce, and yellow cheese. Cut toppings out of felt and attach with hot glue. Neck strap is ribbon attached with hot glue. 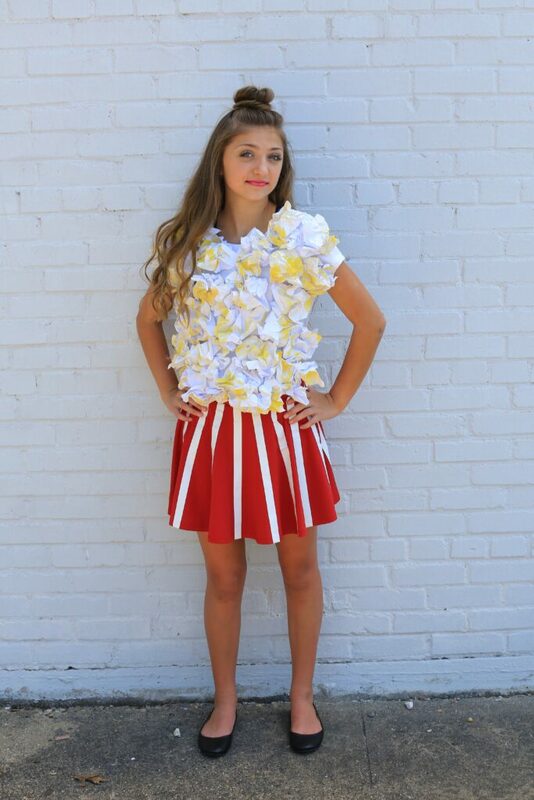 Popcorn- For this costume you simply crumple up white copy paper, lightly spray with yellow spray paint (butter) and then attach to a white t-shirt with hot glue. The skirt is a red skater skirt with white stripes added out of 1″ duct tape. Gumball Machine- Get ready to glue! 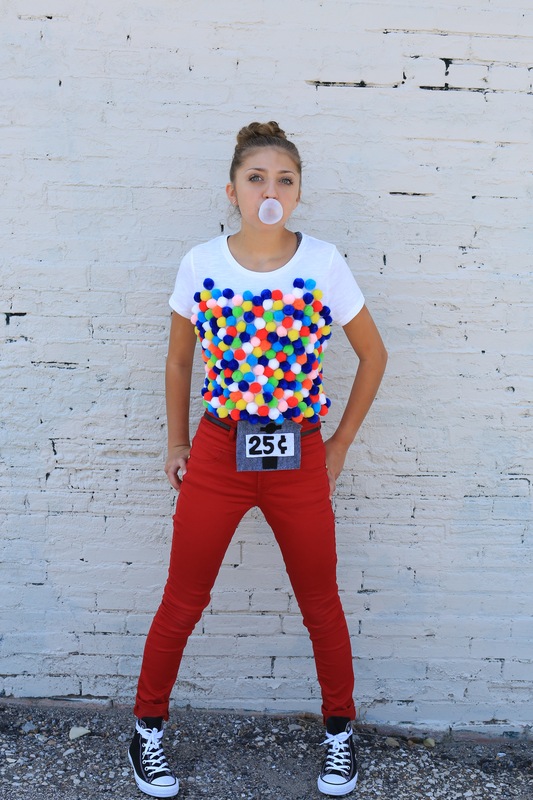 Take 1.5″ pom poms and attach with hot glue. The belt is made out of felt and then attached with a safety pin! Donut- Use a pool tube and spray paint your donut and frosting. 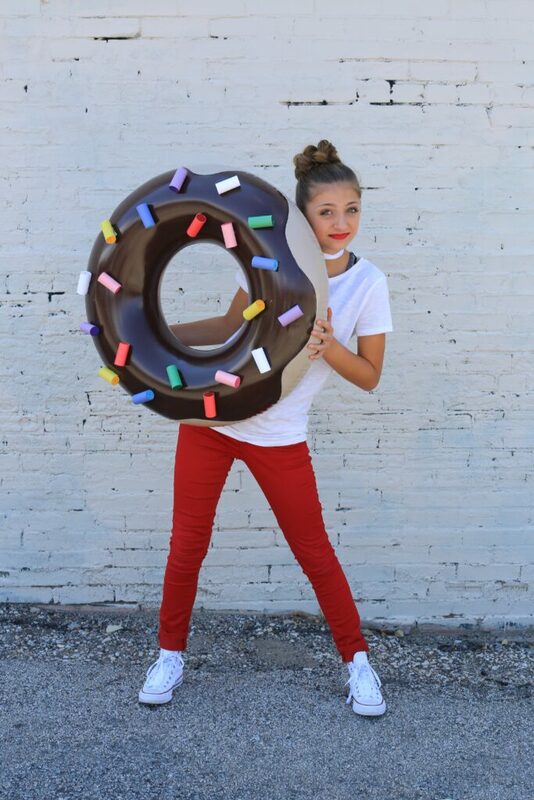 Dig out your old foam hair curlers, wrap them in construction paper and hot glue them to your donut! (Find new foam curlers at your local dollar store). 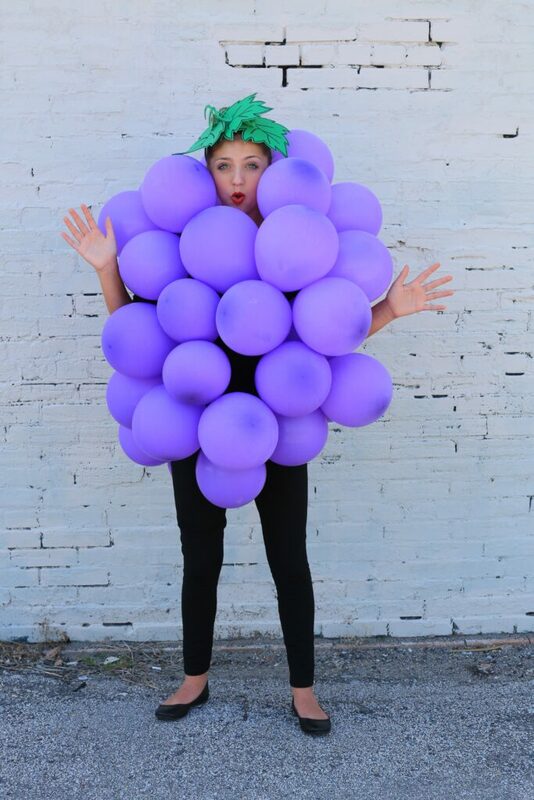 Grapes- Blow up purple balloons and safety pin them to a t-shirt. Topper made out of greed fun foam and attach with hot glue to a head band. 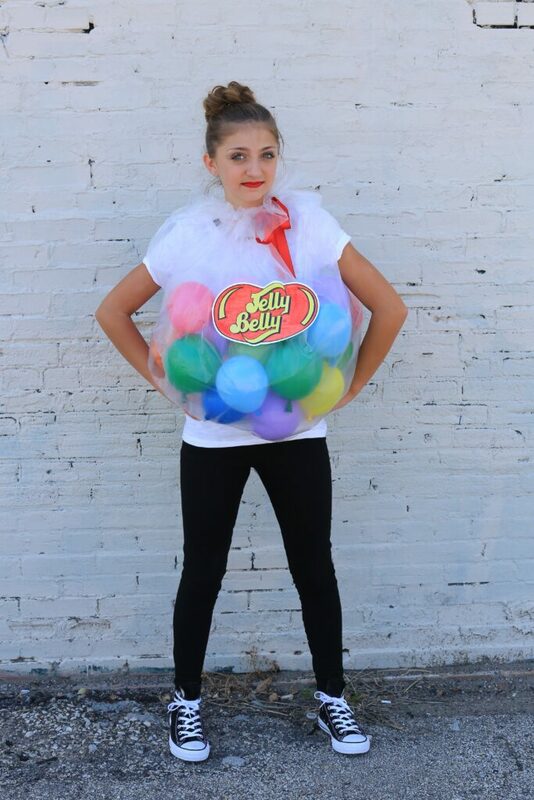 Jelly Belly’s- Everyone’s favorite jelly beans! Fill a clear trash bag with small various colored balloons. Cut small holes for arms and secure around the neck with a red ribbon. Print a jelly belly logo and tape to your bag of jelly beans! Halloween is a family favorite holiday. 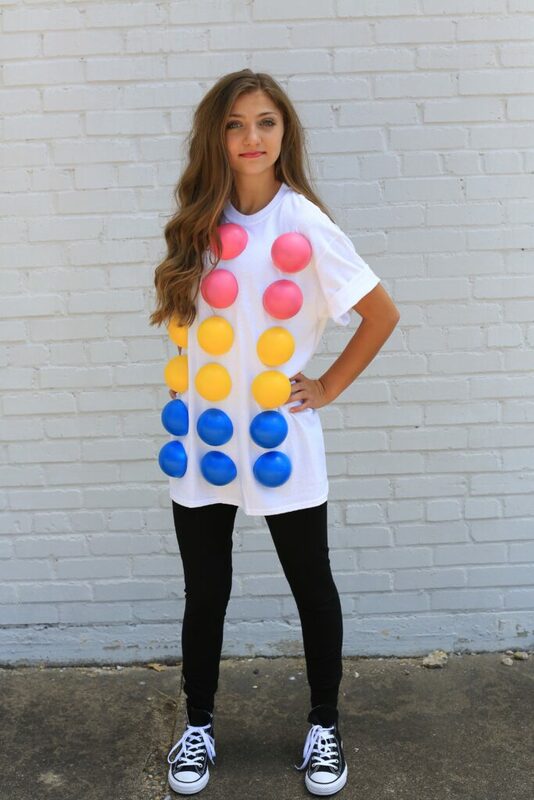 We hope you have been inspired by one of these cute DIY costume ideas! To see Kamri’s video click on the link below!